Does your yard need a pop of fall color? 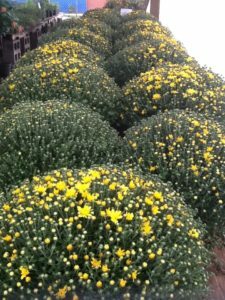 Stop by the garden center in Madisonville for mums, snapdragons, decorative kale and garden dishes perfect for fall. Plant mums in soil that drains well and in an area that these beauties can get plenty of sunlight. Make sure to have room in the soil for the root ball and water daily to keep your mum blooming. Add plenty of mulch to the bedding around your mums before the cold weather arrives to protect your plant. Stop by our garden center for plenty of tips from our garden expert, Paul. We also carry everything you need for gardening in spring or fall. Shop earlier for the best selection and choose from a variety of colors sure to make your yard pop with color! This entry was posted on Friday, September 28th, 2018 at 12:14 pm	and is filed under News & Updates. You can follow any responses to this entry through the RSS 2.0 feed. Both comments and pings are currently closed.